The Condo of your dreams, on the most private and safe Street of the most quiet Puerto Aventuras town on the Mayan Riviera. 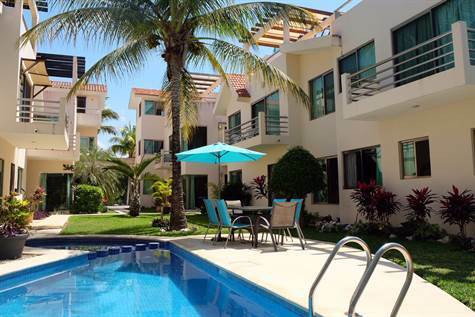 The Condo is on hole #3 of Puerto Aventuras Golf Course, and only 7 minutes away from the beach. On the ground floor of a small 8 Condos complex. 2 full bedrooms, an additional double bed in the "siesta corner", 2 full bathrooms with showers. The kitchen, dinning room and living room are combine in a large open area very well naturally lightened. Back Terrace with awning and roof terrace with exterior shower. It is sold fully furnished with appliances. Brand new AC´s in all rooms and open area. Private Pool and very low maintenance cost. We sell because we bought a piece of land in Puerto Aventuras on the water to build a new condo complex. Puerto Aventuras is the most safe and quiet town in Mexico with all services close by.